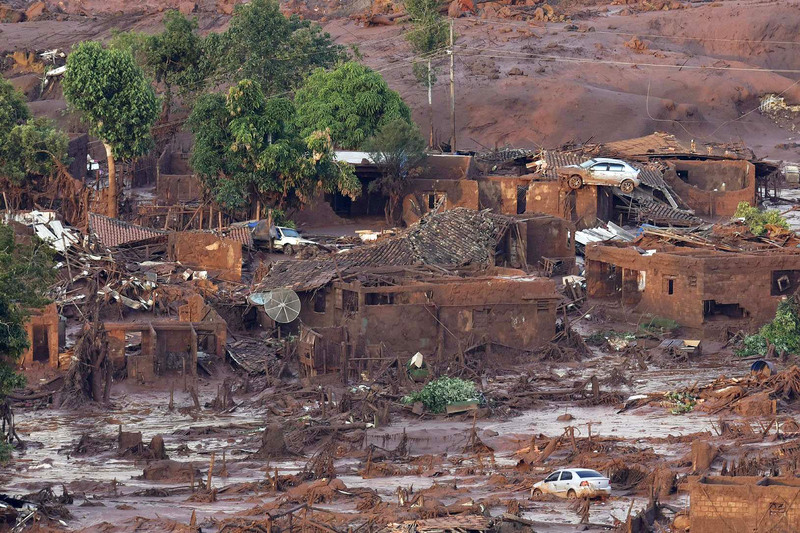 A “mountain tsunami” is how firefighters in Mariana, in Minas Gerais in south-eastern Brazil, described the bursting of mining company Samarco Santarem's iron-ore tailings dam on November 5. The dam took just half-an-hour to entomb half the village of Bento Rodrigues in 18 metres of iron-ore tailings, reddish mud and water slurry. The miner's union initially reported that 15-16 people had been killed and 45 people were missing. But reports of the number of dead and missing people underplays the scale of this disaster that many say could have been avoided. A firefighter, one of the first on the scene, told the November 11 Australian Financial Review, how the slurry flowed at speeds of up to 70 kilometres an hour, cutting a pathway of fury hundreds of metres wide down the hillsides and into the Bento Rodrigues valley. More than 50 million cubic metres of tailings slurry — enough to fill 20,000 Olympic-sized swimming pools — poured down the mountain, spreading across 800 kilometres. It reached the Rio Doce and, by November 26, the Atlantic Ocean. Bento Rodrigues, a village of 600 people, is no more and at least 635 communities, or some 250,000 people, are without potable water. Sanmarco initially insisted that the slurry was not toxic. Others, however, have not been as sanguine. Ricardo Baitelo, from Greenpeace Brazil, told Green Left Weekly that while the official results of the water tests were due in early December, a number of groups, including the Minas Gerais Institute of Water Management, have undertaken their own tests. They found dangerous metals including mercury, arsenic, chromium and manganese at levels exceeding safe drinking water limits. Klemens Laschefski, a researcher with the Federal University of Minas Gerais, said that as Brazil has never had to deal with such an enormous environmental disaster “it is impossible to calculate the real impact right now”. Laschefski said the changes in the river currents and the new geochemical conditions in the river's sediments will adversely impact on species, possibly leading to extinctions. He said water plants in the area are now endangered because the mud covering them will harden like cement due to the high iron content. Aloysio da Silva Ferrão Filho, from the Oswaldo Cruz Foundation, said, “the entire ecosystem is under threat”. He said the disaster will affect the marine food chain, possibly including the Abrolhos coral reefs. Ferrão said the high concentrations of heavy metals in water samples from the Rio Doce could lead to the accumulation of metals in the food chain, possibly reaching toxic levels in some organisms. “The biodiversity of the river is completely lost. Several species including endemic ones must be extinct”, he said. Questions are being asked about who gave the orders to open dams along the Rio Doce to allow the toxic contamination to reach the Atlantic Ocean, threatening leatherback turtles and other aquatic wildlife along the way. Samarco's early efforts to try to persuade anxious communities not to worry about the tsunami of red mud highlights its gross negligence. Samarco is a 50-50 joint venture between Australian-owned BHP Billiton and Brazil's Vale. It initially tried to blame environmental factors, saying several small seismic tremors may have caused the dam walls to crack. However, the US Geological Survey did not record any major earthquake in the region and this part of Brazil is not prone to large tremors. Scientists say it would have taken a much larger quake to crack a dam wall. The more likely cause of the tailings dam wall break is Samarco-BHP's negligence. A 2013 report by the independent Instituto Prístino indicates that Samarco had been warned about the integrity of the tailings pond, and its precarious relationship to the Fundão dam. The institute recommended more frequent monitoring of Samarco's dams and said that there was the potential for the Fundão dam to be destabilised. It also recommended the government not renew Samarco's licence. Laschefski said Samarco's refusal to act on known risks, including a possible rupture in the Fundão dam, its lack of an emergency contingency plan, or any alarm system for the village of Bento Rodrigues, and the fact that it increased its waste production in recent months meant that the company is culpable and the government is compounding the disaster. Baitelo told GLW: “Mining companies must be fully accountable for the waste they generate, and they should have a contingency plan in case of accidents. This clearly didn't happen in this case. Baitelo said that “affected communities are still struggling — demanding access to water and help to rebuild their properties”. On November 11, BHP Billiton CEO Andrew Mackenzie and Vale CEO Murilo Ferreira refused to answer a question about whether Vale had diverted extra water from another mine to the tailings pond behind the dam in recent weeks. At BHP-Billiton's Annual General Meeting in Perth on November 19, Mackenzie again avoided answering a question from Nikola Casule from Greenpeace Australia about the warnings in the 2013 Institute Prístino report that the dam was not safe enough to keep operating. Others point to government negligence and corruption as elements in this disaster. Mauricio Guetta, a lawyer for the environmental organisation, Instituto Socioambiental, said in an opinion piece on November 11 that Brazil is afflicted, not just by the lack of planning, but with “a disrespect for the rights of the vulnerable”. There is indifference by government and companies in relation to environmental laws governing natural resources, he said. Brazil “must adopt prevention practices designed to anticipate [disasters] and thus avoid them”. He was scathing about the government's inaction. Despite the magnitude of the disaster, it was not until more than a week later that President Dilma Rousseff flew over the affected area. The government has now suspended Samarco's licence, fined it US$62.5 million, and said the company had to cover US$262 million in clean-up costs. Latest reports indicate that Brazil is taking BHP Billiton to court for $7.2 billion. Guetta blames the close links between the Brazilian government and the mining industry, noting that Vale donated to the president and the main opposition candidate, Aécio Neves. The governor of the state of Minas Gerais was another beneficiary of the Vale's political donations. Baitelo said: “The fine by [the government's environmental agency] Ibama is far from enough to make up for the irreversible damage caused to the river Doce, the ecosystem and affected communities. Deutsche Bank estimates the total cleanup bill could be as much as US$1 billion. Baitelo is angry the government seems to have learned nothing from the disaster. A bill was recently approved in the Senate that would diminish environmental protections in “strategic infrastructure projects in the national interest”, including mining. BHP has a history of failing to dispose of its toxic tailings safely. In 1984, cyanide-laced tailings from its open-pit copper and gold mine in Papua New Guinea damaged the Ok Tedi and Fly Rivers river systems. This harmed about 50,000 people in 120 villages downstream of the mine. Other problems included the mine-induced erosion of the river system, the killing and contamination of fish and the subsequent harm to all other species in the area. Flooding caused by the raised riverbed left contaminated mud on the flood plain, affecting the plantations of taro, bananas and sago palm — food staples for communities. In all, about 1300 square kilometres were damaged. Local landowners led a class action against BHP, which eventually led to the admission that it had discharged 90 million tons of mine waste annually into the Ok Tedi River for more than 10 years. BHP Billiton is the largest mining company in the world, worth $69.5 billion. It must be held to account.